There are two different species of tiger swallowtails. One of these is the Eastern tiger swallowtail (Pterourus glaucus) and the other is the Western tiger swallowtail (Pterourus rutulus). The two species are very similar to one another except that the female Eastern tiger swallowtail is often darker in color than the male. The male and female Western tiger swallowtails have the same coloration. The darker coloration of the Eastern female swallowtail is an adaptation the butterfly has underwent to mimic the pipevine swallowtail. Pipevine swallowtails don't often get eaten by predators because their larva eats the vines of the Dutchman's pipe plant. This plant contains toxins which remain present in the body of the adult butterfly. So by mimicking the coloration of the pipevine swallowtail, the female Eastern tiger swallowtail is safe from predators, despite that her body does not contain toxins. Keep in mind that not all female Eastern tiger swallowtails exhibit the dark coloration. Some of them are yellow like the males. 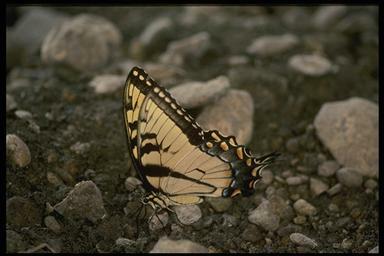 In addition, female Eastern swallowtails in northern areas rarely show the dark coloration. This is because pipevine swallowtails, which the darker tiger swallowtails are trying to mimic, are more common in the south. Both Western and Eastern tiger swallowtails lay spherical green eggs on trees or shrubs that serve as food sources for the caterpillars once they hatch. The eggs are about the same color as the leaf they are layed on, which serves to camouflage them from predators. When the caterpillars first hatch they are brown and white and are said to resemble bird droppings, which also keeps them from being eaten by predators. In a short time their appearance changes into green, hairless, caterpillars that have a colorful eyespot on their body near their head region. This eyespot is another adaptive mechanism that scares off predators. When a predator, such as a bird, sees the eyespot it has no idea if it belongs to a caterpillar or a larger animal such as a snake. The caterpillars of both Eastern and Western tiger swallowtails look similar to one another. Once the caterpillar has fully developed it forms a light brown chrysalis that resembles the bark of a tree. It takes about 30 days from when tiger swallowtail eggs are layed for the adult butterfly to emerge from the chrysalis. Copyright © 2008-2018 ButterfliesSite.com. All rights reserved. Images from istockphoto and the Corel Corporation - and may not be copied.